Hobbit mania has erupted in Wellington, New Zealand’s capital, for the world premiere of Peter Jackson’s new trilogy, The Hobbit. The first of the three movies – prequels to the Lord of the Rings trilogy – was shown at Wellington’s Embassy Theatre on Wednesday evening. Stars flew in for the event, which saw Wellington rebranded as “the Middle of Middle Earth”. Tens of thousands of fans – some in costume – gathered around the theatre for the screening. Some camped overnight to secure spots close to the 500m-long red carpet that led to the theatre, which was decorated to look like the entrance to a Hobbit house. The Hobbit: An Unexpected Journey is the first film of the trilogy, which altogether cost $500 million to make and was filmed in New Zealand. The second film is set for release in December 2013 and the third in July 2014. Oscar-winning director Peter Jackson said it was “emotional and very humbling” to see such a crowd. Ahead of the screening, the New Zealander said he was nervous about the film’s reception. “Nothing’s ever perfect and it never will be; it’s a real mistake if you say we’re stopping now because we’ve made the perfect film,” he told Radio New Zealand. 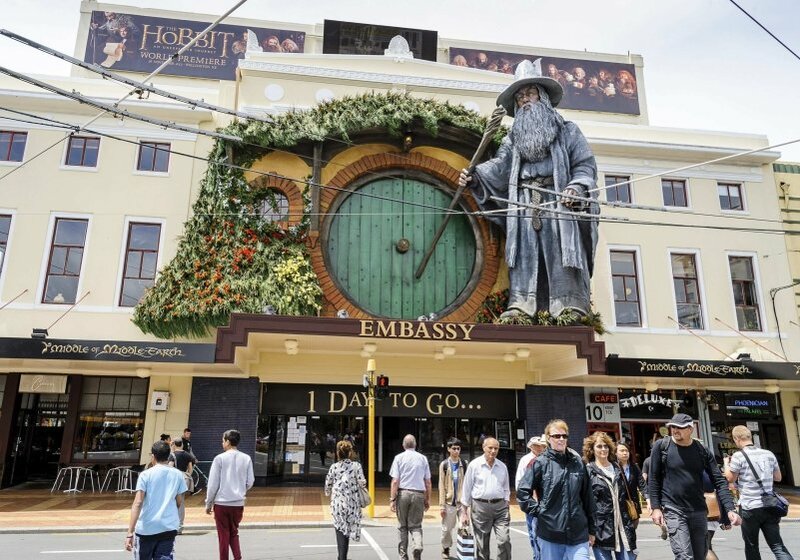 Wellington City Council put months of planning and just over NZ$1 million ($820,000) into preparations for the premiere, Radio New Zealand reported, as did tourism officials looking to boost visitor numbers. Tony Everitt, Asia manager for Tourism New Zealand, said he expected tourism revenue to rise by as much as US$400 million annually because of the films. The trilogy has taken more than five years to film and hit a number of obstacles. Filming was delayed for months over funding problems and a row over actors’ wages – at one point studio executives suggested moving filming to Britain. Earlier this week, Peter Jackson also rejected claims from animal rights group PETA that up to 27 animals had died during filming, saying no animals were harmed. In Wellington, however, crowds turned out for a party. Up to 100,000 people were said to have gathered for the premiere.